One of the highlights of the Structures Inquiry that I am currently doing with my students is a woodworking workshop. Each year I invite a person into my class to run the workshop. He prepares the materials for the project I have chosen (this year I chose the windmill). He brings the tools and woodworking tables into my room and he runs the sessions. This year the grade 1 classes joined my class. The children love this workshop – and I love seeing the smiles on their faces when they they see that they are building something themselves with a hammer and nails. This year was extra special to me because, not only were the girls successfully building, but the parent volunteers were all women. Two days later, all the classes had tried their hand at building and we were ready for the next phase of the project: painting and decorating. I set aside Friday afternoon as ending the week with a burst of creativity is always a good thing. Painting and decorating the windmills. The children enjoy this part of the project as much as the building. When they took their efforts home, the windmills were held proudly in their hands. I can only imagine the smiles the structures would bring to the faces of those who admire them. Once again the woodworking workshop was a success. No matter what grade I teach next year, I know I will include this activity on my programme. Do you enjoy building with a hammer and nails? I can imagine the children would have loved this activity. They did. It was definitely the highlight of the week. What a neat experience for them! I was so happy when I found this series of workshops. They really give the kids a wonderful experience. What a wonderful activity, Colline! Even my 4-year-old granddaughter loves working with wood. For her, it’s usually nailing scraps of wood together from her daddy’s workshop. I remember as a young child using my grandfather’s jigsaw to cut puzzles from scrap wood. Your students are lucky to have you as their teacher. I always had great success doing building projects with my students, too. When I taught grade 5 & 6, we made rain sticks with pvc pipes, drilled holes diagonally down the sides to insert thin dowels, and used sink plugs for the ends which also enabled them to hang them to dry after painting and finishing. Great fun. Souunds like you had fun – and the kids do too, I am sure. 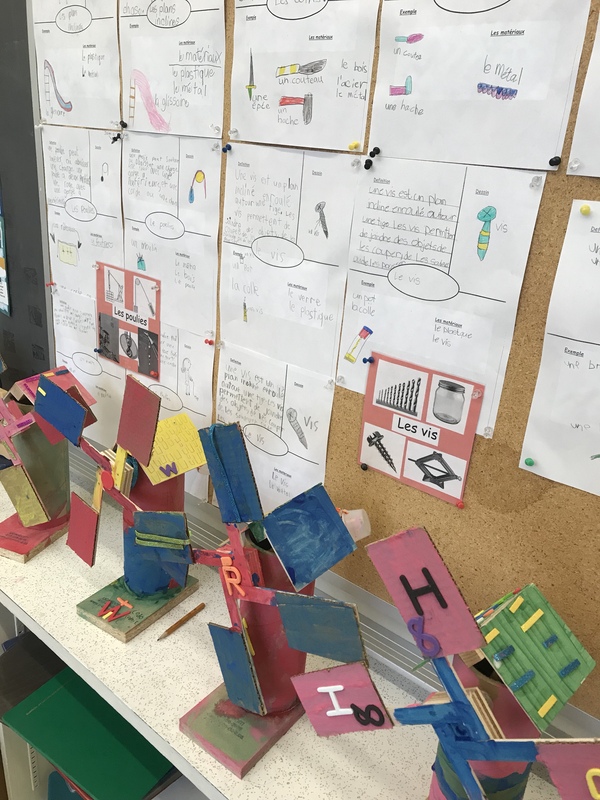 I have seen the projects that the grade 5s build at our school and they can be quite creative.